Dining out in North Wales? Why not take advantage of dining at the Grill Restaurant or one of our fine dining experiences at Noëlle's. Non-residents are welcome but to be sure of a table visit our dining page and book now. We offer the most comprehensive spa experience in Wales and all residents are entitled to use our spa facilities which also includes the use of our new Thermal Suite. 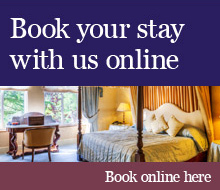 See our special breaks page and take advantage of one of our current offers. We have recently been placed in the top 10 spa hotels in Wales. If you are looking for spectacular wedding venues in North Wales you won’t find anything better than the facilities here at Tre-Ysgawen Hall. Book your wedding now to avoid disappointment.